This website closed down early 2007. The main theme of this website is underground music, usually of a darker nature. A wide variety of musical styles is covered, from dark folk to experimental electronics. Music reviews form the most important part of the site. Funprox.com has been active in various manifestations and forms since November 1998. 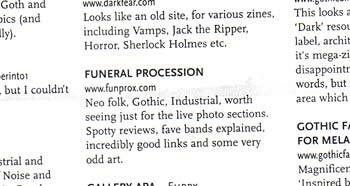 In the distant past it was called ‘Funeral Procession’, later shortened to Funprox. In the summer of 2004 this site has undergone a major reconstruction. Early 2006 a second renovation followed. Funprox.com started as a personal playground of webmaster Hans D. Nowadays various co-contributors helped to keep the reviews section varied and up-to-date. Watch previous incarnations of Funprox.com at archive.org.